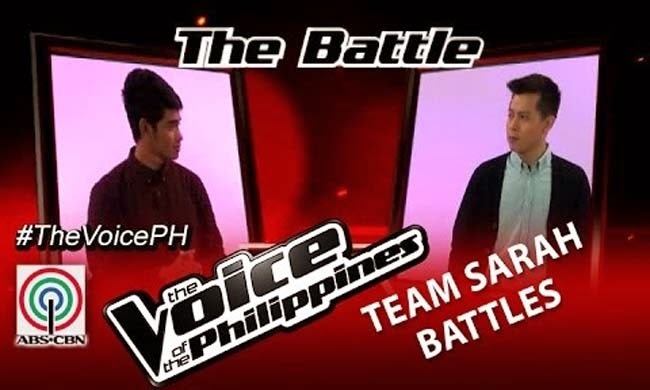 It is time for Team Sarah’s Daniel Ombao vs Jason James Dy to enter the Battle Rounds in The Voice of the Philippines Season 2 on December 6, 2014. Daniel Ombao is a wake boarding lover who came from Bataan but left home to follow his passion for music. Singing ‘Tadhana’, he was able to secure a spot with Team Sarah. He wanted to prove to his father the music is his path though his old man wanted him to be an engineer. Jason James Dy works as a professional serenade singer and was able to use his experience to swoon the coaches. Singing, ‘Stay With Me’, he became a three chair turner as he was able to pour emotions into his song. As it can remember, Lea and Apl De Ap even joined Sarah in her chair to share a hug as the emotions from his song was overwhelming. The Battles Round Result: During the coaching session, Ombao met Dy to be his rival. Ombao thought Dy was really good and very professional. Sarah said they have really same level and the performance will speak for itself. On the Battle Round, Ombao and Dy sang‘On Bended Knees’. The audience seemed to feel the love through the rendition of the song. Ombao seemed to forget his lines but the coaches seemed apologetic. Bamboo said that Dy did well with falsetto but bet on Ombao. Lea and Apl rooted for Dy. In the end Sarah had chosen Dy.